But summer is golden, opening up the time, making it easier to jump on the bandwagon of good health and a heartier commitment to exercising. My fingers are crossed that I can do the same now that the school year is upon us! Being techy-minded, I gravitate to "oohing" and "ahhing" over the new gizmos. Luckily "geek" is in vogue. In this fast-growing world of innovation where no stone is left unturned, that includes tech help for healthy lifestyles. 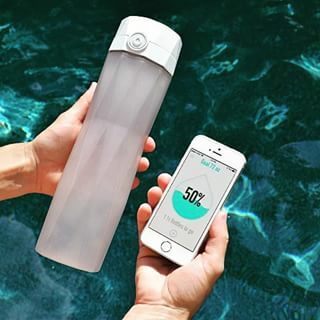 Luckily, there's soon to be "an app for that" as there's a "smart water bottle" on the horizon. HidrateMe is one of the latest crowdsourced "body-tech" finds out there on Kickstarter. 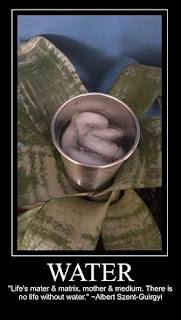 The main HidrateMe objective is to track your water intake in real time. With a Kickstarter goal of $35,000 to fund the HidrateMe bottle, they chimed in as overachievers, raising more than $600,000. Slate has an interesting article on the subject. I will say, I like it. I like the reusable concept. I like that it is chic and moves us away from purchasing plastic bottled water (& the waste that produces). I know I drink more water when I am trekking around town with water in hand. I could totally see the reminder glow as a good Pavlovian response for me to drink more water!! However, I will say, the price point of $46.95 might be a little high for my blood. Though, it might make my Christmas wish list as a splurge item. At the very least, I think it's brilliant that the HidrateMe team saw a need, went the distance with their entrepreneurial spirit to make it happen, and clearly found that this is a niche needing to be filled (as Kickstarter proved). Kudos, team! I can't wait to see where you go!